The young brothers and sisters of the Nation of Islam (NOI) are striving to become leaders of their communities, their high school and college campuses, as well as produce leaders in their peers outside the Nation of Islam. The Nation of Islam Student Association (NOISA) is a college organization consisting of young adults of the NOI and young adults who are willing to help in the salvation and the mental and spiritual upliftment of our people. Therefore, the NOISA Houston Chapter is honored to host their first annual youth conference entitled: The TR(YOU)TH Summit: The Blueprint to Our Future. The students of the NOISA are working tirelessly to become the example for their peers as well as the next generation of young leaders. Thus, it is imperative that we support, attend, and inform every young person we encounter about this momentous event. The TR(YOU)TH Summit will be held Friday-Sunday, August 9-11, 2013, at the Holiday Inn- Reliant Park in Houston, Texas. Registration is only $25.00 per person. The summit will include awesome forums, workshops, a major concert and more! 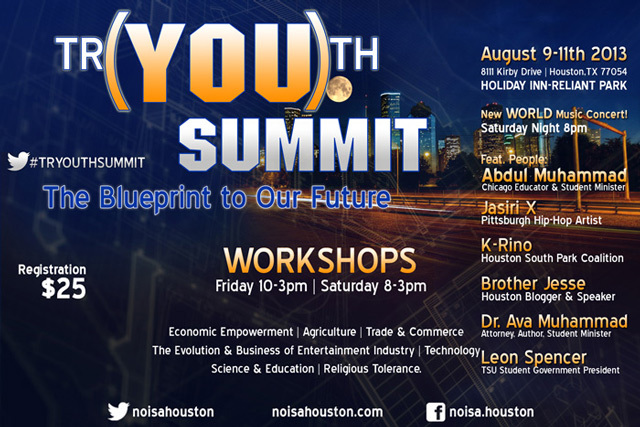 See the full schedule @ http://noisahouston.com/tryouthsummit13.html. I am honored to be one of the selected presenters! Let's make our youth our No. 1 priority.